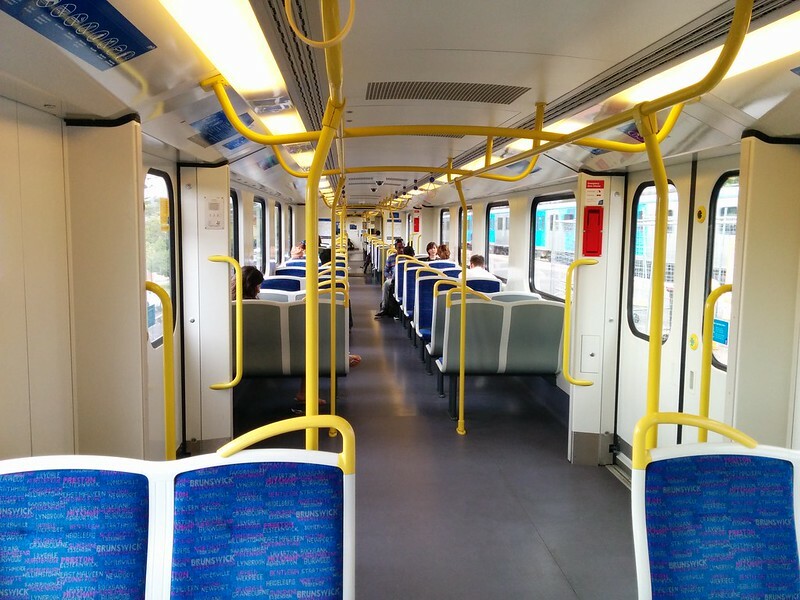 Metro has been trying modified carriage layouts on the trains. Some Comeng trains have had seats removed near the doorways, and now a Siemens train has shown up with a similar treatment. The pros: the larger doorway area should help speed up loading and unloading, and provide space for more people in crowded conditions. Based on how people have reacted to the Comeng layout, this seems to work. The cons: still very few hand holds away from the doorways, especially in the middle of the carriages. Fewer seats overall of course; about 16 removed per carriage, including many (all?) of the “priority” seats. Note below the special needs seats all seem to be now located near the driver’s cab. This would obviously be an issue for someone with limited mobility, even assuming they know those seats are there. If it were me, I’d encourage people with a need for a seat to always speak up and ask someone else to give up theirs, even in the absence of such designated seats. For the trainspotters, it’s carriage 832M and friends. Update: Here’s a couple of snaps from December of the similar Comeng train layout. Fewer seats? – How many seats do we want on our trains? Update 17/3/2015: There’s been coverage of this story by Channel 9 and the Herald Sun overnight. The change will be rolled out to the entire Siemens and Comeng fleets, and it’s hoped this will help the train system better cope with growth until the next order for high capacity trains is rolled out, presumably sometime later this decade. The seat reduction is said to be around 15% — about half the comparable changes on the B-class trams recently. I think this is a reasonable balance — the first problem is just fitting people onto the train; hopefully once they’re on board, most people travelling a long distance can get a seat at least part of the way. Currently some modified trains have no allocated Priority Seats for those who specifically need them. Obviously it’d be nice if someone who needs a seat was always offered one (no matter if it’s a special Priority Seat or not)… but in any case, the Priority Seats will be re-allocated — apparently they ran out of stickers! And by the way, the feedback I’ve heard from passengers has been very positive, especially those who board having to stand. “Spacious!” I heard one exclaim the other day. Next → Next post: Apples: $5.98, or $6.48? I’m actually surprised they haven’t gone on the Comeng the same with the xtraps – as in removing seats to make a 2×2 layout. Agreed with the handlebars issue. However, I do believe the layouts are a step in the right direction. Daniel J., I believe the reason they haven’t gone to a 2+2 on the comeng is to do with the seat bar which is under the 3rd seat in the comeng, but the 2nd in an X-trap (See Daniel B’s photo above), The 3rd seat can still be removed, but it results in a lot of underfloor work as a result. Regarding the fewer seats it would be great if everyone could grab a seat, but when trains are at crush the focus needs to be on getting more people on and is a good practical way of making the network better. Sydney and London trains have a pole in the middle of the standing area near doors. 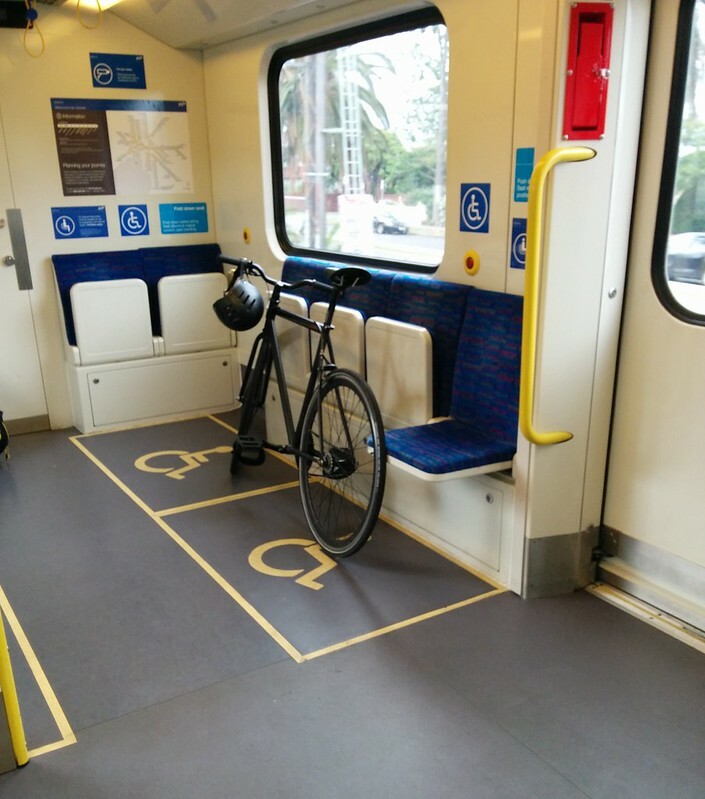 Would be a good addition to Melbourne’s trains. 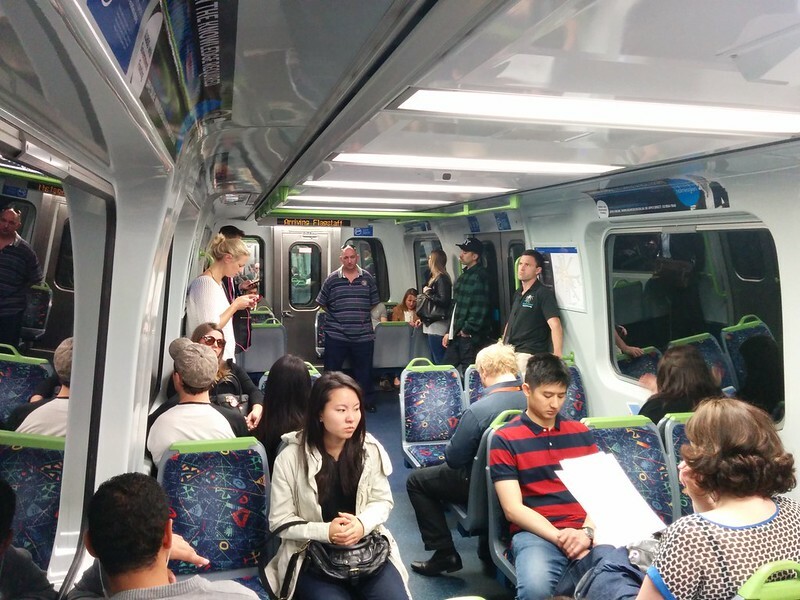 For a packed peak hour train, the removal of seats is a good idea. Not so good for off peak when some people are standing that would otherwise be seated. PS My complaint of people wearing backpacks on PT is now being addressed with adverts prompting passengers to remove them. At last! 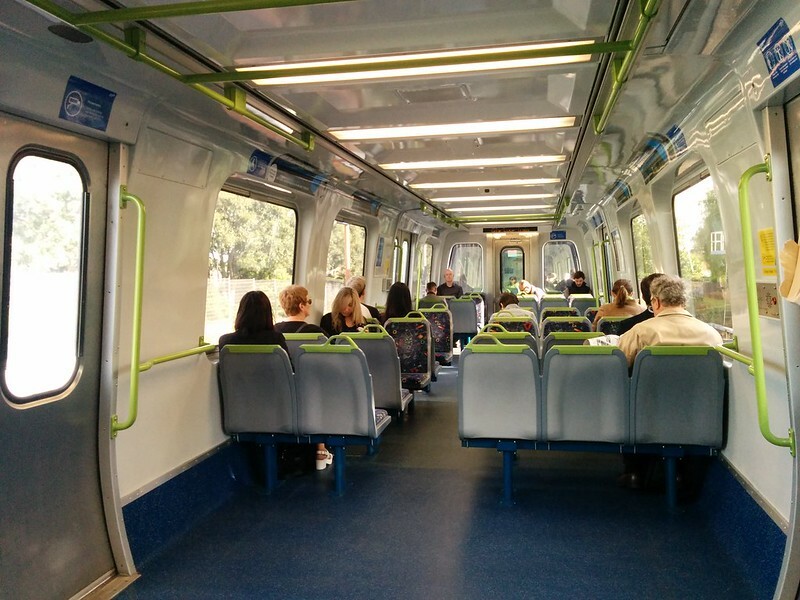 A simply way to increase handholds would be to move to front to back seating (as has always been the case in Sydney). Then you would have twice as many seat back corner handholds. Front to front seating not only has only half as many seat back corner handholds, but they’re so far apart that it’s impossible to walk through the car keeping a continuous hold. That is a great discouragement to moving away from the doors. I’ve never understood why Melbourne has stuck with front to front seats. To me they are obviously inferior from a privacy point of view, as well as in relation to the handholds. They’re a relic of older compartment carriages, and have no good purpose in saloon cars (you would leave a few front to front seats in each car for friends who prefer that). Straps that are above the heading of a sitting passenger are not particularly useful. They should be closer to the centre of the aisle. I guess there may be a structural reason for the non-optimal position. I’m a tall drink of water (6ft 2) and those Comeng seats/layout are a disaster. I much, much, much prefer the layout of the Siemens or Xtrapolis trains. As for removing the seats – had to be done I think. The peak crush is getting significantly worse now everyone is back to work/school. There are many trains that I have to let go from my inner zone 1 station because I can’t fit on (especially if train is delayed). I wonder if a comparison with Sydney’s Tulloch trailer carriages is warranted. Of course a strictly numerical comparison would be meaningless, because these (and all other suburban trains) are double-deckers, but I did find them to be very roomy inside, and they take a LOT of people when crush-loaded. They have a large vestibule area (the bit near the doors) with very few obstructions, and compact stairs to the two decks. They still have a 3+2 seating arrangement on each deck, but they have back-to-back seats with seat handles. 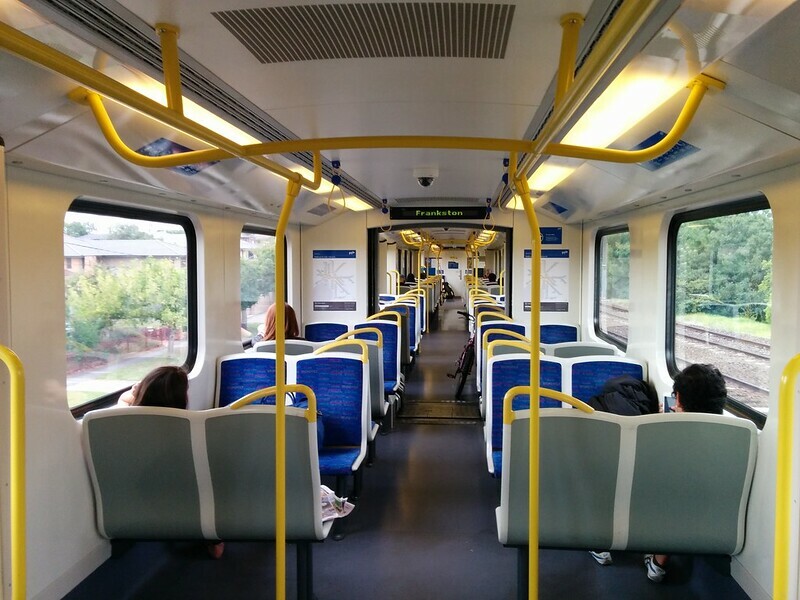 I find that people in Sydney move down the aisles much more than in Melbourne, and even move through the doors between carriages more freely (eg to move to less crowded carriages). I still have that Sydney mind-set and walk between the carriages sometimes, but I don’t see anyone else in Melbourne doing it (people think I’m an A.O. when I do). I certainly notice the lack of handles (or grab-straps) in Melbourne, so that should really be addressed. Note that the tullochs in Sydney are no longer in service – they date from 1964! @Roger (backpacks) Guilty as charged. But now that I see the adverts, I swap it to my front. That means I can still manoeuvre nimbly (which I can’t quite do if I’m carrying it in one hand) and it’s not much different from a pregnant woman (or a pregnant man http://i.telegraph.co.uk/multimedia/archive/01423/pbeerbelly1_1423319c.jpg ). I think you just contradicted yourself there. You say that they have no good purpose, then mention one! And of course a “few” of them likely means that those friends miss out because those few get taken quickly. Having said all that, most of the time I prefer front-to-back ones, so I can stretch my legs. Reduced seating is clearly a necessity at the moment, but I don’t like the idea that this should be considered anything other than a necessary (and temporary) evil. And I simply don’t accept claims of structural reasons for lack of handholds in suitable places. If there are no structural mounting points in, say, the centre of an area, simply have bars spanning those areas between whatever mounting points are available. As for the new Siemens layout, I don’t like it (which is not to say that it’s not a good idea). It looks like they have removed my preferred seats, the front-to-back ones just inside the wind breaks (which themselves have gone, I see) that allow one to rest one’s head back and have a sleep. This can be done on some seats in the ends of the carriages, but these folding seats tend to slope down and are uncomfortable. And especially now, you’re more likely to be asked to move to make way for a wheelchair. And what’s happened to the wheelchair ramp cabinet? The reason they are removing the windbreaks and the seats directly behind them is that it is crowding around the doors that is causing the most problem. The windbreaks were to close to the doors anyway and so passengers standing against them were getting in the way. Is having the ramps ready at the doors faster than having they in the drivers cabin? With the need to lock them in maybe not? Unless the driver carrying the ramp slows the driver walking to the doors? Maybe there is a weight issue with the ramps? Having the ramps near the doors requires twice as many ramps. Bring on more raised areas of platforms to let the wheelchairs board without ramps. @Tom, ramps at the doorways might be marginally quicker. I’m guessing the reason for them is the Siemens driver doors are so narrow.